The Sam Olden Yazoo Historical Society Museum, located in the Triangle Cultural Center in Yazoo City, brings together the County’s diverse past – from fossils dating back some 45,000 years to Native American relics, Civil War History, and African-American History, to the legendary trainman Casey Jones, and so much more. Yazoo’s history began with Native Americans, both regional and small local tribes. The small tribe of Yazoos, who gave the region its name, was ‘along with the much larger Choctaw Nation which dominated the area’ the first of these people to be encountered by French explorers led by Cavalier De La Salle in 1682. It was the French who, on the maps, first name the river, which flows through the middle of the county “The River of The Yazous.” The county and city were later namesakes of the river. No one is quite sure what the word Yazoo meant in their tongue, for the tribe quickly died out after the Europeans came. Take a stroll through a few thousand years of Yazoo history and legend. The Sam Olden Historical Museum features exhibits from Civil War days, to the great Yazoo City fire of 1904, as well as those depicting World War I, the history of the old Main Street School (now the Triangle Cultural Center), the 1927 flood, political history, items from the daily lives of Yazoo’s early citizens and apparel from the early days of the County. Also chronicled in the museum are the many famous sons and daughters from Yazoo County, including: acclaimed author of My Dog Skip, Good Old Boy, and other stories, Willie Morris; comedian and storyteller, Jerry Clower; NFL Hall of Famer Willie Brown; actress Stella Stevens; former Mississippi Congressman, Mike Espy; famed motivational speaker Zig Ziglar; Col. John George Quekemeyer, distinguished World War I soldier and aide-de-camp to General John J. Pershing; and the former Governor of Mississippi and former chairman of the National Republican Party, Haley Barbour. 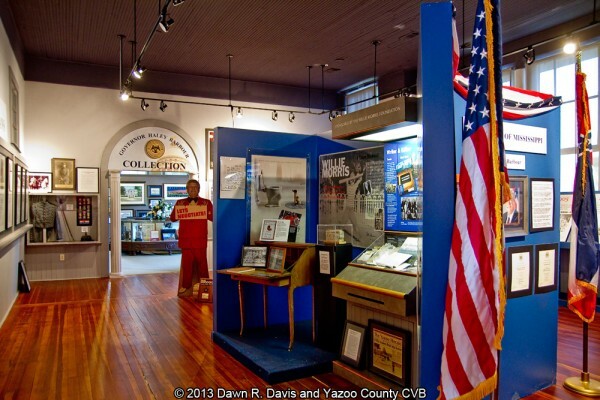 At the Sam Olden Yazoo Historical Society Museum, you can take a glimpse into Yazoo County’s rich heritage and culture. It’s a great prelude to visiting sites of interest around Yazoo City and Yazoo County. The museum and the Triangle Cultural Center are open on weekday mornings and other times by appointment. For more information or to schedule your visit call 662-746-2273 or 601-966-6623. I am fascinated in the way Willie Morris described the town and the time , I am also a fan of my dog skip, was this a real dog? and did he really live and know the people from Yazoo City when Willie was a boy? I would one day love to come and see your town and the history it has to offer. Hey, David! Thank you for your post. Yes, Willie Morris really was from Yazoo, and many of the characters are real residents of Yazoo, some of them still living here today. Skip was a real dog, his dog, and is really buried in the back yard of his childhood home. You can drive past the home, though it is privately owned, today. The actual grave market that Willie carved is in this museum, and a replica is in the front yard of the Triangle Cultural Center (the old Main Street School which houses the museum). We’d love for you to come see us! To the person who replied to my post,, thankyou for the response, I have always been fascinated with the Delta region of Mississippi although it seems so far away as I am in Sydney Australia. I will be planning to come and see you once I have organised the trip. Willie Morris via his books have provided me with a special place of time and history and I would love to see Yazoo and the old houses hopefully are still there. I also had a dog similar to skip which knew everybody in my town and helped me adjust through life. I have always been fascinated with this areas history and I believe Willie Morris has brought this to life for me through the pages of his writing. Did he really grow up in Grande avenue? Did he really spend time at the cemetery with skip? How old was he when Skip died? Yes, he grew up in a house on Grand Avenue in Yazoo City. The house is still there, and viewable from the street, but as I mentioned, privately owned, so tours or looks inside are not available. A great place for you to stop by when you visit, other than the museum in the Triangle, is the Ricks Memorial Library next door to the Triangle. There is a local historian there Monday – Wednesday who can tell you tons of fact and interesting information about Yazoo County, named Mr. Ellzey. I don’t recall how old he was when Skip died. I know he was a young boy, though. I’ve read that later in life, he had another dog who was very special to him, and that he got special permission to have that dog buried in the city cemetery (Glenwood, where Willie himself and ‘the witch’ are buried) but I haven’t been able to find any records on it. It’s one of the mysteries that makes Yazoo so special. Many of our old homes are still standing, and most have been preserved. In 2012, Yazoo City’s Town Center Historic District was one of This Old House Magazine’s “Best Old House Neighborhoods” because of the abundance of old homes, some of which can be bought for less money (and restored) than one would think. If you search for those terms you should be able to find the write-up on their website. Thanks Dawn I would love to see the brochures, It is good to know that a lot of the old homes are still standing as they are a voice from times of the past. The gentleman Next door (Mr Ellzey)sounds like the sort of person I would love to talk to at some stage, I bet he could tell a few stories about the town and events that would have happened in certain years. I would like to say I appreciate your response and I will at some stage come to your museum, you have been very kind and I wish you all the best from Australia. P.S. Did they pull down the old Dixie theatre building? Was the area named after local Indians? Dave, I am looking for help, tracking down H.T. Harrison aka Henry Thomas Harrison, a man who enlisted in the 12th Miss Infantry Reg at Sartaria, in May 1861, was discharged in Virginia, in November 1861, and who appeared in New Orleans on August 21, 1865 and obtained a parole as a private in the 12th Miss, listing his address as Yazoo County. He was born in Tennessee in 1831 and appeared in Dayton OH in 1902. His father was Henry Hargrove Harrison, a steamboat agent with offices in Nashville, from 1850 to about 1862. Something brought Harrison to Yazoo County. My name is Erica Sterling and I am a research assistant at the Southern Education Foundation in Atlanta, Georgia. I am looking for exhibits or materials related to educational history in Mississippi, and I was hoping you could give me more information about the holdings at the Sam Olden Historical Museum. Do you have any artifacts, writings, or photographs related to education? And if so, could you give me an idea of what specific items are in your collection, and the time period? For example, photos of school buildings or children in a classroom from the early 1900s, or textbooks used in the mid 1900s. In short, items that relate to schooling (i.e. vocational, high school, college, etc.) at any point in history. Any help you can provide is greatly appreciate. Thank you very much! Hi, we will be travelling through Yazoo City at the beginning of October and wondered whether the museum is open during the day or if it is by appointment only? Thanks.